There’s a fundamental principle of graphic design and art in board game design: once gameplay starts art and graphic design should become invisible. Consider how important art is to the games actually based around existing art such as crowd-funding master Jamey Stegmaier’s Scythe (featuring the art of Jakub Rozalski) and Martin Wallace’s Dr. Grordbort’s: Onward to Venus (based around the world conceived by Weta Workshop concept designer Greg Broadmore). Game illustrations build worlds, capture drama and define atmosphere. Game graphic design provides information economically and amplifies immersion. Art and graphic design contribute to brand credibility and marketing. But once gameplay begins you’re not supposed to think about art and design. This may seem to run contrary to everything we understand about the visual language of board games but, of course, the role of art and design changes during the process of game development. Art and design needs to fulfil different roles in the consumer journey. In marketing it provides an opportunity for people to imagine, covet, and share the potential of the game world, the talent of the artist, and (with the introduction of forums and crowd-funding) be actively involved in the game’s creation. If Kickstarters are anything to judge by, art is often the tipping point for conversion. Ninja Division’s magna-inspired art in Relic Knights. CoolMiniOrNot has proven successful with beautifully rendered game after game such as Zombicide. 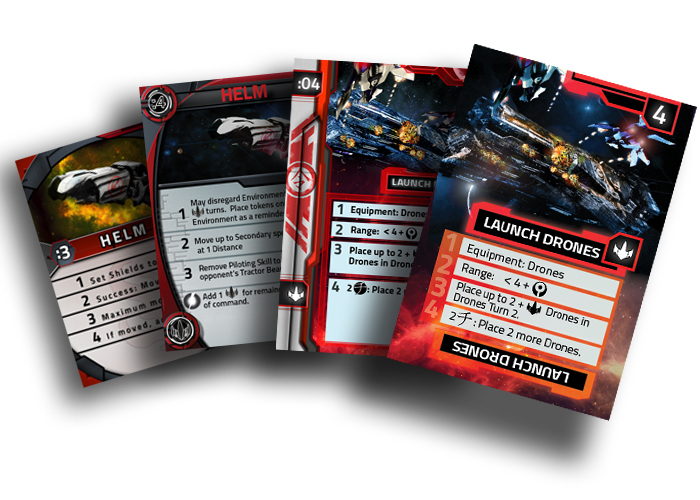 Star Realms have produced two indie sensations Star Realms and Epic Card Game. Finally, let’s not forget how important art visuals are in that definitive moment when you get the physical box, unpeel the plastic wrap and see the components in all their glory. No one ever forgets the first time they rummage through a new board game, salivate over the mats, boards and cards or pop and drop the cardboard pieces into special sealable plastic bags. But the moment you get together with friends, open a bottle of beer and the game starts, something happens . . . If you’re having a great gaming experience you probably aren’t thinking about the cool-looking monsters, the proximity of diagrams and text, the detail of the miniatures or the gorgeous bevelling and metallic sheen on the background. Instead, the art and graphic design seamlessly and invisibly smoothes the gaming process, it works in concert with the game mechanics to build a social and collaborative imaginative life quite beyond the parameters of the rules, or the pictures on the cards. Android: Infiltration’s borders suggest network lines in an art deco style. Sid Meier’s Civilization: The Boardgame’s character sheets hint at multiple periods when it includes ornamentation on its research and finance wheel plus the hand drawn sketch on ancient paper. Art and functional layout bleed together seamlessly on Twilight Imperium’s race sheets. Those race sheets include a lot of information without clutter or confusion. So art and design needs to fulfill contradictory roles: define the game atmosphere and barely draw attention to itself, show off the skill and talent of artists and designers and effortlessly weave the participants into the game experience, be gorgeous, cool, immersive and provide utility. Because at the end of the day all the cardboard pieces, tables, mats and board have one goal: they’re there to be used, so usability is their final measure of success. With this in mind, why is graphic design and art the last part of game development? Shouldn’t it be rapidly prototyped, iteratively tested, rejected and recalibrated? You may have play-tested with friends, blind play-tested with strangers, and shared your print in play with the BGG community but unless your graphic design and some art is part of that testing then you could be in for a big surprise by the time you get your production copy. Maybe the font looks futuristic but is difficult to read, maybe the pieces look amazing but simply aren’t big enough, maybe your colour management is a mess, maybe the intricate icons you’ve lovingly crafted over months are confusing, and maybe the art that shone on your blog doesn’t work well with the graphic design, or simply doesn’t comply with printing requirements. 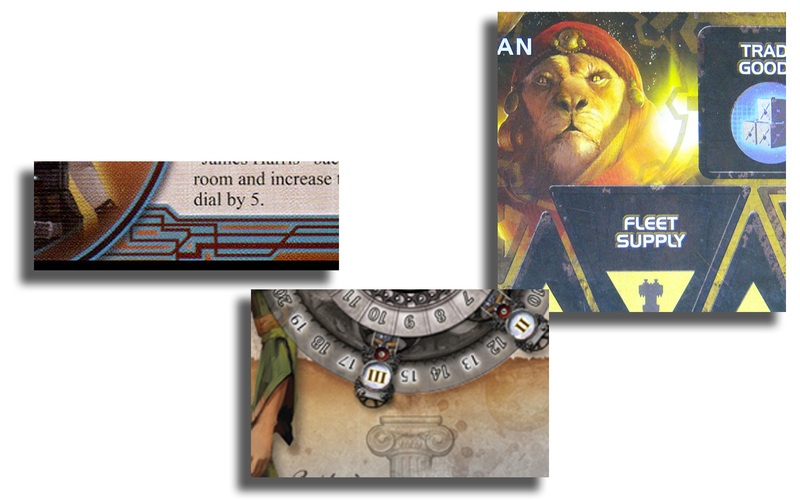 The evolution of Fusion’s Command Cards over the past eight months. Fusion: Space Combat is many months away from ‘Kickstarting’ but we’ve already been through several iterations of graphic design. Our priority is getting the design tested with time to incorporate user feedback and suggestions from the gamer community. We look forward to sharing all our work so far in the coming weeks.